For a time in the 1970s, the Mauritius Kestrel was the most endangered bird of prey in the world – with only four known individuals remaining in the wild. The restoration of the Mauritius Kestrel from the brink of extinction in the 1970s to around 800 individuals today is one of the greatest conservation successes in history. Unlike the Common Kestrel of the Old World and the American Kestrel of the New World, there is no difference in coloration between the male and female Mauritius Kestrel. The Peregrine Fund has been involved in conservation of the Mauritius Kestrel ever since we sent a biologist named Stan Temple to the Indian Ocean in 1973! He went there to determine the status of this beautiful bird of prey. Later, we supported the work of Carl Jones and his associates. For several years, one of our falcon breeders, Willard Heck, spent every fall and winter on Mauritius helping to breed kestrels and hatch their eggs in captivity. We also played an active part in the conservation efforts. The Peregrine Fund produced 46 birds in a captive-breeding program at our World Center for Birds of Prey from 1988 to 1991. The Idaho-based breeding stock then was returned to Mauritius and successfully joined the wild flock. The population now numbers as many as 800 individuals, thanks to careful husbandry of wild eggs and young, control of exotic predators, supplemental feeding, and nest boxes in areas without suitable nesting sites. 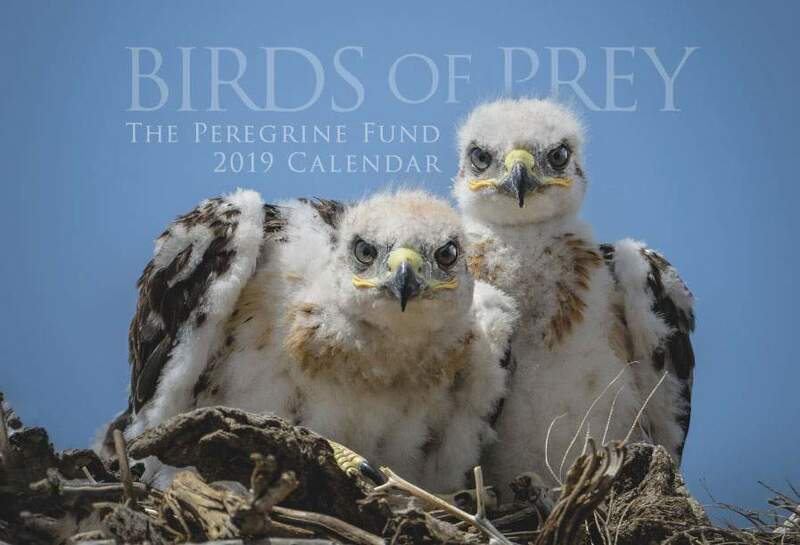 Recently, The Peregrine Fund has again provided support to complete island-wide surveys of nesting falcons to assess the current status of the species. True to its name, the Mauritius Kestrel is found in only one place on Earth – the island nation of Mauritius in the Indian Ocean. This island, located off the coast of Africa, east of Madagascar, is characterized by a series of mountain ranges, coastal plains, plateaus, ravines, and tropical forests. Historically, the Mauritius Kestrel preferred to make its home within the island's primary forests and could be found at all elevations. 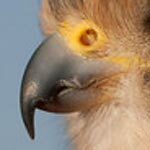 However, the living habits have changed a bit for this once highly endangered bird of prey. After its population began to crash, The Peregrine Fund and other organizations stepped in to help. They released captive-bred birds, which became established in secondary forest and even on lightly wooded slopes, where the birds remain today. The Mauritius Kestrel has a rust-colored head, a white breast with black spots, a notable striped tail, and a body built for the kind of tricky flying one needs to engage in when hunting within a dense forest habitat. Its short wings, which are also more broad and rounded than those of most other kestrels, help enhance maneuverability when flying between branches and other tightly growing vegetation. In fact, researchers believe that the Mauritius Kestrel has the most adaptations for living in a forest setting of any kestrel species! This flight capability makes the Mauritius Kestrel very skilled at plucking small prey fom tree trunks and branches. Another flying technique that this kestrel shares with other kestrels is the ability to hover in the air, almost like a helicopter. By facing into a headwind and flapping their wings and maneuvering their tails, these rare falcons can remain in one place, suspended in mid-air, as they search the ground for prey. The Mauritius Kestrel does not migrate and spends all year very close to home. 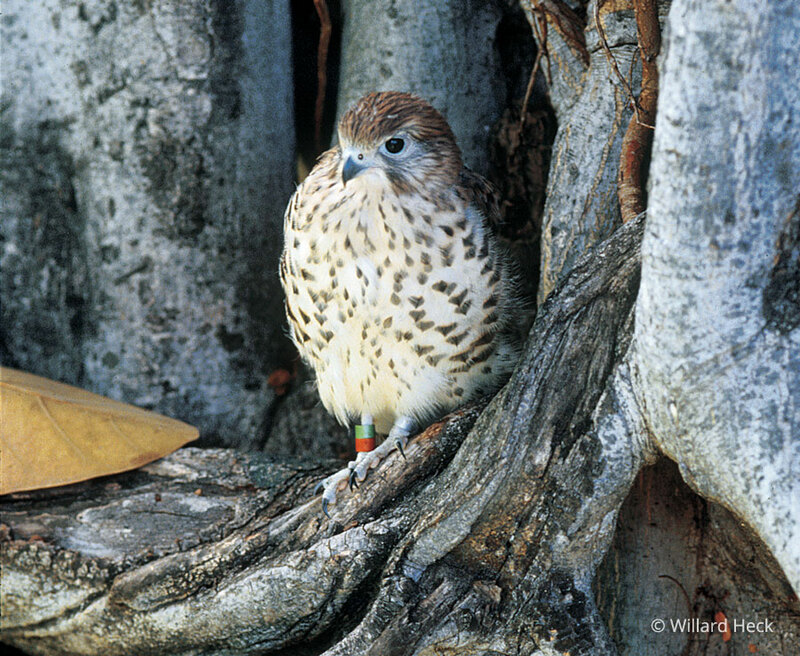 In the 1970s, the Mauritius Kestrel was the most endangered bird of prey in the world. At that time, the entire wild population consisted of only two known pairs! The species began to lose ground when humans started cutting down their forest home for construction and agriculture. As if the loss of habitat weren't bad enough for the species, the agricultural use of the pesticide DDT on the island persisted for more than 20 years, which also contributed to the species' decline. Through captive breeding and release programs, which began in the 1970s, the population slowly began to recover. About 20 years later, scientists estimated the population to be around 250 individuals. Their numbers continued to increase and by 1997, there were about 400-500 birds in the wild. Today, biologists estimate that there are 600-800 Mauritius Kestrels in the wild. Though the species' population appears to be stable, scientists continue to survey the wild population to monitor reproductive success. One of the problems that could plague this species is that of extreme inbreeding, which occurs when two closely related birds, usually siblings, produce young together. If this happens often over time, the population can experience a loss of of genetic variation. If all of the individuals are too much the same, the population's overall health and long-term survival may be affected. For example, in the case of disease, if there is a lot of genetic diversity, there usually will be some birds that are immune or otherwise able to survive the disease. If there is little diversity among the individuals, then it is less likely that some will have inherited this immunity or ability to survive. Extreme changes in habitat or other factors that require the birds to adapt to changing conditions are usually more catastrophic for populations with little genetic diversity. To make matters worse, in the past 10 years their habitat has changed quite a bit, mainly due to the heavy invasion of exotic vegetation, which makes it harder for the kestrels to locate and get to their prey. Habitat deterioration will no doubt continue to be a problem for these kestrels throughout their range on this heavily human-populated island. The staple of the Mauritius Kestrels' diet is the Phelsuma gecko and small lizards that live in trees. In fact, geckos and lizards make up about 90% of their diet. However, like most raptors, these small falcons are also opportunistic, meaning they will eat whatever they can catch. Mauritius Kestrels have been known to consume adult and young birds, including some birds introduced to the island such as Red-whiskered Bulbul, Waxbill, Spice Finch, and Barred Ground Doves, but they also were documented eating another bird found only on Mauritius, the Grey White-eye. They also eat small mammals, such as shrews and rats, and insects, including dragonflies, cockroaches, and locusts. They search for prey from a perch, then make short, fast dashes after their quarry once it is spotted, or they may hover in the air and capture prey in short aerial chases or by stooping, or diving, down onto it. Like most other falcon species, the Mauritius Kestrel does not build a stick nest. Instead, it nests in natural cavities in cliffs and trees and has adapted to nesting in artificial nest boxes placed in trees by biologists. Nest boxes were put up to allow kestrels to nest in a wider array of habitats and areas where they would not have nested due to a lack of natural nesting cavities. These nest boxes have allowed the Mauritius Kestrel to successfully breed in young, secondary forests found in patches especially on the east side of the island. During breeding season, the female lays 2-5 eggs, which she incubates for 30 days. After hatching, the parents work hard to feed the young and provide them with enough food to grow into healthy fledglings. Imagine having up to five mouths to feed, not including the adults! It is a lot of work and young Mauritius Kestrels grow very fast. In less than 40 days, they will begin to take their first flights. For the next year, the young will stay in or near their parents' home range as they learn to hunt and survive on their own. Though they have their parents' help and protection, life for a young kestrel can be very challenging. In fact, about 70-80% of all young birds of prey die before they reach adulthood! 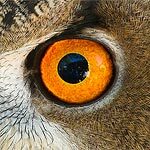 Young, inexperienced raptors make easier targets for predators, and as they learn to hunt, they may become injured or killed if they fly into windows or become tangled up in barbed wire fences. Some may not gain the hunting skills they need in time, and sadly those young will starve. Even though Mauritius Kestrels are predators, life for them is a daily struggle to find enough food, avoid natural and man-made hazards, and successfully breed and raise young. The World Center for Birds of Prey offers fun ways to learn about birds of prey. A mounted female Mauritius Kestrel specimen is in the display case in the “What is a raptor?” exhibit where visitors can see this beautiful falcon up close. An introductory video at the live bird presentations also will give you more insight into the world of the Mauritius Kestrel and The Peregrine Fund's role in its conservation. In addition, interactive activities, tours, interesting videos and a children's room with activities from coloring sheets to quizzes to costumes and a touch table are available for the curious mind. We also have several different birds of prey on display year-around. Knowledgeable staff and volunteers are on hand to answer any questions you may have about the Mauritius Kestrel or any other bird of prey.